Chovy’s KDA rises to a crazy 104 after today’s win. In an LCK season where unpredictability has been the theme, one team has remained the league’s only constant—Griffin. As the only returning LCK team to retain their entire 2018 lineup, Griffin’s play this year has been on another level. In their 10 games so far, including the two played today, Griffin has looked on the verge of losing only once. And even in that close game against Hanwha Life Esports, Griffin found their path back to victory with beautiful teamfighting, capping off their comeback by earning the first Pentakill of the 2019 LCK season. Not even the SK Telecom T1 dream team were able to dent Griffin, getting obliterated by the 2018 LCK Summer Split finalists in tonight’s opening match. Sword’s Sion was the focal point in Griffin’s methodical game one win against SKT. Picking champions that scaled like Kai’Sa and Sion, Griffin displayed their ability to play a slower more late game focused style, rather than the insanely-aggressive early game focused compositions they’re known for. In contrast, game two saw Griffin revert to their early game focused style, beating SKT in a quick 28 minutes. With lane dominant champions like Lucian and Jayce, Griffin bullied SKT throughout the entire game, finding solo kills and skirmish victories seemingly every minute. 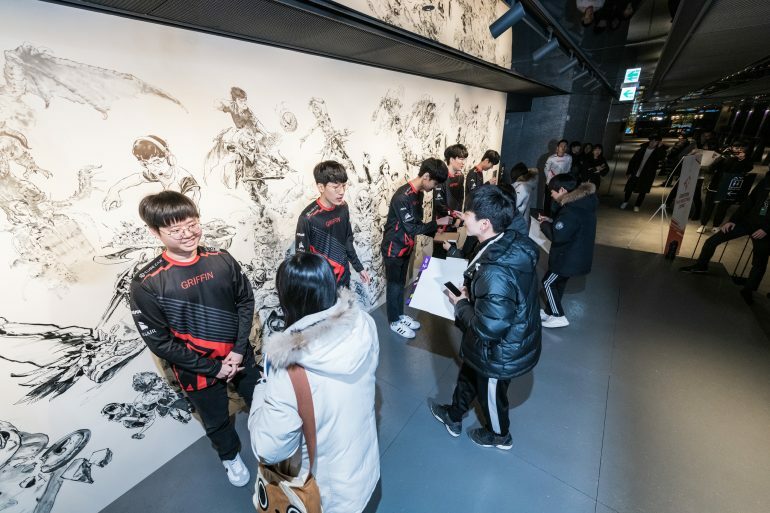 “I want you to die two or three times so that you can have an even KDA with me,” Griffin support and game two MVP Son “Lehends” Si-woo said as a message to mid laner Jeong “Chovy” Ji-hoon, whose KDA statistic rose to a record-breaking 104 after tonight’s win. Despite being on the verge of death near the end of game two, Chovy managed to survive, thus ending yet another deathless match day. “As always, we’re gonna keep our Griffin style and show a great performance,” Sword said about Griffin’s upcoming match against fellow first-place team, Sandbox Gaming. Griffin will try to take sole possession of the LCK’s top spot when they face Sandbox on Feb. 2.